MalAcetic Aural is a natural solution developed in the USA containing 2% acetic acid and 2% boric acid which give it both antibacterial and antiyeast activity. This scented solution is useful in maintaining a healthy environment in the ears of dogs and cats, especially pets who swim. MalAcetic Aural is useful where bacteria and yeast have been identified on cytology. This cleanser will gently remove wax and cleanse and dry the ear canal. Directions: Shake well before using. Apply to the ear and gently, but firmly, massage the base of the ear. Use a cotton ball to remove any excess solution. Repeat as necessary or as directed by your veterinarian. Close the cap tightly after use. My Doberman suffered with recurring ear infections and I've spent a fortune in vets fees as insurance will no longer cover his ears. I use this product twice a week and it has worked so far. I buy this product once a month. 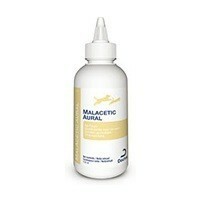 Depending the type of bacterias and yeast inside the dogs ear, this works great. My dogs where licking each others ears, causing them to get very smelly and 'sticky'', after the first treatment with this they where all better. Bought this to stop our dog's constant scratching of her ears and the smell! It does the job brilliantly and just one use gives her relief from the itching and removes the odour.